Welcome back to Burrwood Forest, where Sticky Burr and his friends are getting ready for a harvest fair. But not if Scurvy Burr can help it! The most prickly burr of all (some even call him an evil genius), Scurvy is stuck on jabbing squirrels, making trouble, and keeping all the burrs prickly through and through, whatever it takes. So say good-bye to ukuleles and niceness and get ready for spiders and beetles and sinister villains as Scurvy schemes to give the hook to Sticky Burr’s cheerful plans! 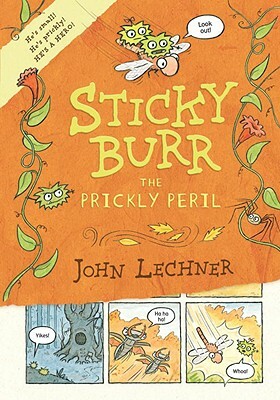 John Lechner is the author-illustrator of the picture books THE CLEVER STICK and A FROGGY FABLE. He lives in Needham, Massachusetts.